Let’s talk more about the five (5) activities that you can do when you don’t have dizziness or neck or backaches. One activity to help you through the holidays and so you can stay healthy and active is hiking! Hiking can be a great way to get back to nature, a great time to be with family and friends, or just to think and reflect. 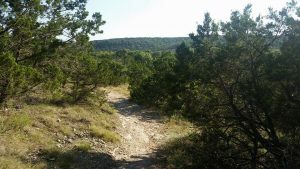 Hiking at Government Canyon’s Savannah Loop is the easiest one to start (2.12 miles); for more advanced hiking try Lytle’s Loop (4.74 miles). For longer day walks, the front country is open and you can walk to see the Dinosaur Tracks (about 5 miles one-way). Wear good shoes and bring lots of water. Pets are allowed in the Backcountry, and not in the Front country. Government Canyon State Natural Area trails are open Friday through Monday; Closed Tuesday through Thursday (off Galm Road and FM 1560). I suggest you turn right at the ranger station and park near the back far parking lot. Some other great places to hike are Eisenhower park (off 1604; pets are allowed) or Frederick park (off I-10; no pets allowed). Both places have hiking trails that are paved and rugged trails.